Arrow Sewing Cabinets: We've Got A Challenge For You! We'd would LOVE to reach 8000 Facebook likes by this Friday, May 18th at 5 pm, so we're changing up our normal giveaway! Instead of giving away two sewing tables, we'll be giving away FOUR! That's right, two lucky Facebook fans will each be receiving our original Gidget sewing table*, and they'll each get to choose their favorite sewing/quilting store to receive one as well. Yippee! To enter, go to our Facebook page and click on the "Sign Up For Our Giveaways" tab, then fill out the registration form. If you've already completed the form for one of our previous drawings, there's no need to enter again - you're in! Can't wait until we hit 8000! Good Luck everyone! **This promotion is in no way sponsored, endorsed or administered by, or associated with, Facebook. We hereby release Facebook of any liability. The Gidget sewing table would be used very much at my house in my sewing room...hope I win. I HOPE I CAN WIN ONE OF THEM. I REALLY COULD USE IT IN MY BEDROOM TO PUT MY SEWING MACHINE ON. SO THAT I DON'T HAD TO GO DOWNSTAIRS TO SEW AFTER MY SURGERY TOMORROW. Would love to have one of these. My favorite shop could use one too. 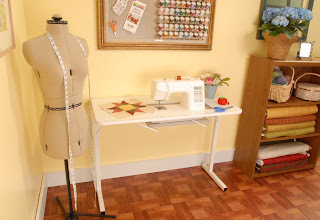 Would love to have this moved in with my daughter and have no place really to sew except of kitchen table, but this I could have in my room and not have to clean up while trying to finish a project. Would love to win this The table I am using is little bigger than a card table, but is very unsteady. Would love to one of the tables I realy like it and it is so much better than the one I have. This would be perfect for my new sewing machine! That sounds wonderful to win! Looking forward to the chance. Thanks. This would be so wonderful to be picked..more that you would imagine! Thank you for the giveaway and good luck to all! Ohhhhhh I have the perfect spot for one of these!! Crossing everything I can!! Good luck everyone! I hope you reach your goal of 8,000 fans by this Friday. I'll try to help by telling as many others as I can. Great contest - thank you! I so hope that my elderly mother can win this so she isn't sewing on the low bedside table anymore. It would tickle her to death to win such a prize. Yay! Congrats on so many fans!!! I've shared the giveaway on my Facebook profile and will be keeping my fingers crossed!!! Thanks for being so generous!